For the better part of 2014, I packed around a bunch of dead weight in the form of hurts, insults, condemnations and lies - carrying it around like baggage everywhere I went. I would rummage through the contents of the bags often to replay, reorganize, and relive that which incited the onslaught of my blubber in the first place. 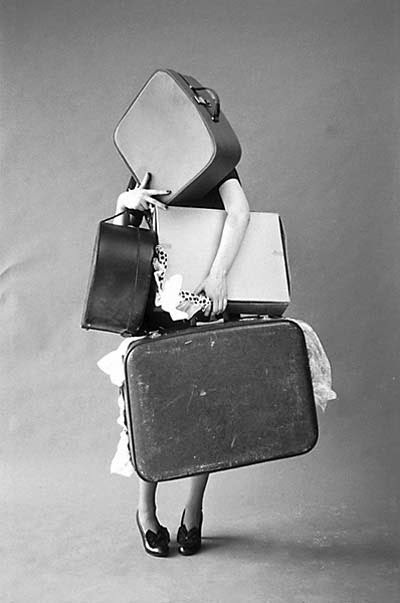 And, when necessary, I added more bags…sometimes another suitcase, sometimes a back pack, sometimes…five or six handbags. Ahem. A girl likes to accessorize, ya know. Over the course of the year, I managed to accumulate so many bags it ultimately became difficult to do anything other than focus my attention on them. They consumed me. Being a bag lady is a full time gig. Truly. And, I was all in. The more bags I hauled around the more I lost myself. Everything I believed…about God…about myself…about my worth and my calling – it all became overshadowed by the enormity of all those heavy bags. Eventually, I no longer felt equipped to write this blog. So, I quit. I no longer felt I could stand on the platform in a church and sing of God’s love and salvation. So, I stopped. I no longer believed I am who God says I am. So, I wasn’t. at some point you start wearing what you’ve packed inside them. Despite my weight gain, the clothes inside my luggage fit quite well. Doubt, fear, pain, confusion… they’re a one size fits all kind of wardrobe. I dressed in layers, and wore every bit of the attire I was hauling around. And, by the end of 2014, I was morbidly obese and miserable. It was time to shed the bags. it’s awfully hard to hold onto the hands of Jesus. Are you carrying around baggage? Whatever it was or is that has you feeling worn and weary, let me encourage you to set the bags down. Two weeks ago, I dropped my bags and grabbed the hands of Jesus again. My bags and all their weight now sit at the foot of the cross. They belong to me no more! I sure feel a whole lot lighter! what we're in the process of gaining than what we're losing?" Losing weight is great. Gaining abundance through Christ is greater!